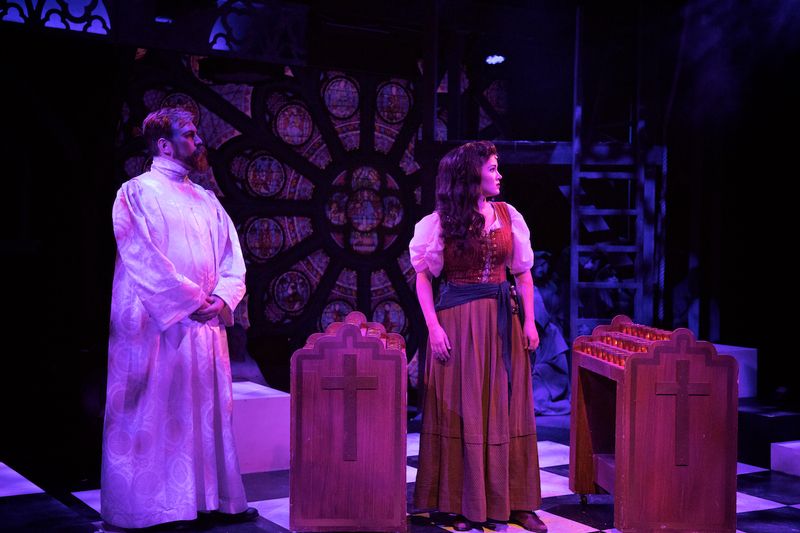 Two stars from our upcoming Hunchback of Notre Dame, Quinto Ott (Frollo) and Laura Helm (Esmeralda), have toured extensively over the last few years. They chat with us about their experiences and how the Mac-Haydn helped prepare them. What are the longest tours you have done? Laura Helm: Jekyll and Hyde for seven months in 2014 and Joseph and the Amazing Technicolor Dreamcoat for 12 months in 2015. Quito Ott: I have done several different types of tours. I’ve been a member of the New York Gilbert and Sullivan players since 2009 and have been a member of their touring company since 2010. They are based in NYC and perform in and around the city, and also do short tours throughout the US, Canada, and UK. Most of the time, the tour performs for one night in each venue before moving to the next town. I also toured with the new north american tour of The Phantom of the Opera. I was an original member of the company and toured with the show for 4 years (8 shows a week every week of the year)! As a performer what aspect of touring was the biggest challenge? Laura Helm: When you change venues. Learning to adjust to a new space is always a challenge, whether it was small wing space or dressing rooms that feel like it’s a half mile away from where you enter. Being present, getting to know your new space and not missing an entrance! Quito Ott: Changing venues is always a challenge regardless if it happens every day or once a month. Relearning traffic patterns, adjusting to different climates and acoustics, and working with people who may or may not know what you need on and off stage keeps us all on our toes. Laura Helm: Staying on top of your health is definitely a challenge. Dealing with different climates, the tour bus, hotels and compressed air on planes are all things to consider. Hydrate and rest when your body tells you to! Sounds like an easy thing to remember but you would be surprised when you are in a high altitude climate like Denver or New Mexico and you aren’t used to the air or how humid Louisiana and California can get. Quito Ott: Its great to get to travel and get to see the country, but it can be rough having to figure out the basics of life in each new town. Finding housing, parking, gyms, and places to eat that are open when you get out of work is a constant challenge. Did your previous experience of putting up multiple shows in rapid succession at the Mac-Haydn help prepare you for the road? Laura Helm: Absolutely! After finishing my first season back in 2012 at the Mac, when I went to work on a show just a few months later I was almost bored focusing on one show. What I definitely think I take away from all my Mac experiences is to respect all in charge, be kind/friends with your castmates and come to get work done! Quito Ott: From learning material quickly to the importance of engaging the audience in telling the story, my time at the Mac-Haydn definitely set me up for success in other shows. This place provides a safe and welcoming environment to explore and develop work, to hone skills, and to push yourself as a performer. Any funny/strange tales from the tour, that you can mention…? 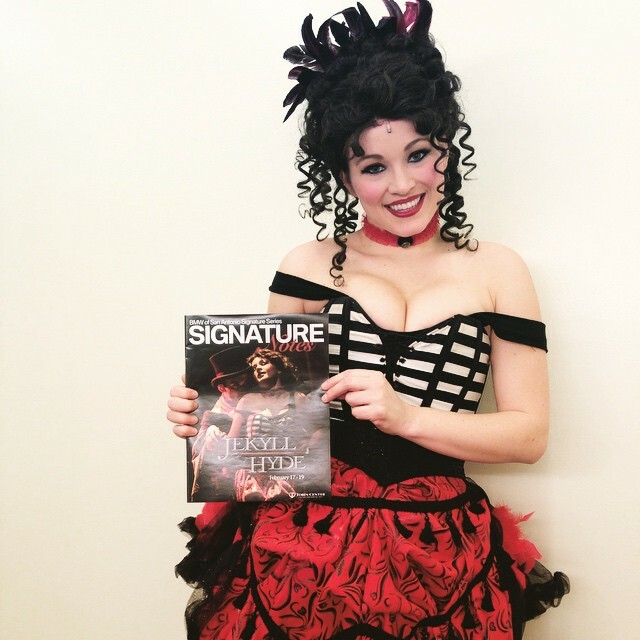 Laura Helm: When I was in Delray Beach, Florida doing Jekyll and Hyde, Frank Wildhorn’s mother came to see the show. After the show we had a meet and greet with her and she told me that I sound and look just like Linda Eder. Whether it is true or not, to have anyone, let alone the mother of the show’s creator, say you sound like the person that originated the role feels pretty good. Quito Ott: After a month long rehearsal process in NYC and several weeks of tech rehearsals, Phantom opened in Providence. On our opening night there were still some glitches, but the craziest was when someone in the balcony mistook the smell of the pyrotechnics for an actual emergency and quite literally screamed “fire” in a crowded theatre. The sound of thousands of seats springing up and slamming as people ran for the doors was deafening. It sounded like thunder from backstage. The show stopped for almost a half hour as the front of house team and the stage managers dealt with the fire department and convined the audience to return to their seats. If you could pick one show to take on tour tomorrow, well at least after Hunchback is closed, what would it be and why? Laura Helm: There are so many amazing shows to choice from but I think I would have to say Wicked. Definitely one on my bucket list! Quito Ott: I would love to do A Funny Thing Happened on the Way to the Forum. There is so much fun material and clever humor in it while also having great music and dynamic characters.